Post dates, directions, RSVP, registries and more. Upload unlimited photos and make changes around the clock. Even change the theme of your website as often as you like. Allow your guests to RSVP online to save time and a stamp. Collect meal choices and other preferences. Optional password protection for the RSVP page, or for individual RSVP events. Set the maximum number of people a guest can RVSVP for as well. All data can be downloaded at any time or viewed in your control panel. Create unlimited photo albums and upload thousands of pics. Quickly add, edit and manage your pics. Upload up to 5 photos at a time and sort and re-order with drag and drop ease. Upload a video of your proposal, and the song you will walk down the aisle to. No limit on media files. If you have background music playing, users can just hit the stop button while on your A/V page. Upload files to your website for visitors to download. This could be maps, an itinerary, photos and more. Find out how much, or how little, your friends and family know! Unlimited polls and quizzes can be very fun! You can also use these tools for gathering information from guests, like 'What's your music preference?' and let them choose from 'Rock, country, oldies, disco', etc. Let your visitors stay up to date on your wedding and news by joining your own mailing list. Send mailings any time. You can add, edit or delete people on your list through your control panel at any time. Select your own custom domain name, www.*****.com. Short and personal for e-mail, invitations and Save the dates. * Custom domain name is for upgraded accounts only. Free accounts receive a custom eWedding URL. Protect your privacy and wedding details with the optional password protection. Security like Fort Knox. Password protect your complete website or just individual pages. Even protect RSVP's individually if you like. Everyone needs to know when and where, let everyone know by posting this right on your site. Save on phone calls. You can even attach a photo of where the event is, link to the venue and include a map and directions. What more could your guests need!? Don't worry about not having enough space or pages to hold your information, we have everything you could need, and more. Here's a list of pages and tools you will find on your website. This is the page people will see when they first visit your site. Upload your photo, save a welcome message and your family and friends can start enjoying your site. This is a great page to leave a special note from the both of you. Maybe a favorite verse or quote. Upload pics, files and create links as well. Share how you met, how he proposed, funny things that happened and more. Everyone loves to hear these stories and know that every single one of them will be read! Upload pics, files and create links as well with each story. Find out what your family and friends really think. Create unlimited polls! You can also use polls for gathering information from guests, like 'What's your music preference for the reception?' and let them choose from 'Rock, country, oldies, disco', etc. Find out how much, or how little, your friends and family actually know. Create unlimited quizzes! Post all your upcoming events on this page. Add the date, time, location and even setup an RSVP for the event. Attach pics for the event, files (maybe an itinerary), web links (URL to venue or directions) and more. What a great way to share with everyone who will be in your wedding party. Explain how you know this person, a little about them and embarrassing stories are always fun too. 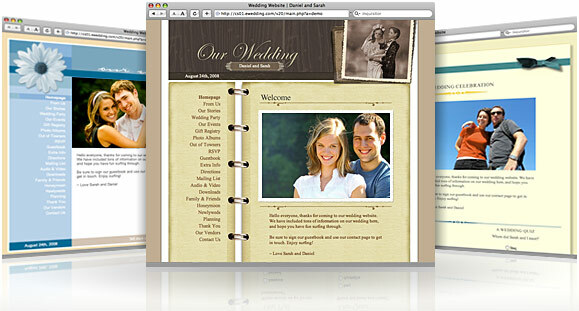 Add pics, files and web links to each wedding party member as well. Link to your registries or provide location information for stores not available online. Unlimited registry entries. Are there items you need that aren't on your registry, or you don't have a registry? Just add them to your own custom wish list. Add an item and where it can be found. For example, '100" plasma tv from the big electronics store'. Unlimited wish list entries. Upload unlimited photos in unlimited albums. Manage your photos and albums quickly and easily with drag and drop ease. Upload, edit and delete multiple photos at a time. We hope you have a lot of photos. Have family and friends coming from out of town? Post all the information they will need on this page. Flight options, hotel options, itineraries, important dates, etc. Whatever they need, you can make available on this page. Allow your guests to RSVP online to save time, and a stamp. Setup just one RSVP for the wedding, or setup RSVP's for all events you may have. Use for the bachelor party, rehearsal dinner, the ceremony, the reception and any other events you have lined up. Add up to 3 questions to each RSVP, for collecting information like meal choices, child care requirements and other preferences. Upload a video of your proposal, and the song you will walk down the aisle to. If you have background music playing, users can just hit the stop audio button while on your A/V page. Let your visitors stay up to date on your wedding and news by joining your own mailing list. You can add, edit or delete people on your list through your control panel at any time. People getting lost on the way to the reception is one of the worst things that can happen on your wedding day. Make sure everyone knows where they are going by posting maps and directions to each venue. List all your family and friends so that everyone can get to know who each other are before the big day. Include names, stories, photos and more. Post your honeymoon destination for everyone to be jealous of. Include pics of your resort, the rolling waves and all the activities you will be enjoying. This is a great page to post stories and pics of your life after 'the big day'. Post pics of your new house, your current plans and thoughts on your new life together. Offer thanks to those who have been of great help during this stressful time of your life. Include family, friends or even vendors or wedding planners who have helped make your perfect day a reality. List the vendors that helped make your wedding day a reality. Post your thoughts on each, good, or even bad. Let everyone know if your florist was the best in town, who knows, your thoughts could make for great referrals for friends getting hitched. This is a page where people involved in the planning of your wedding can meet. You can include important dates and information. This page can have special password protection, separate form the standard password that you use to protect your site. Collect everyones best wishes in your own guest book. You can edit and delete comments in your control panel. You can also choose to 'Preview' comments before they appear live on your site. Once verified, you can let them show. This contact page will let people send you questions and comments without having your phone ring off the hook. Messages are e-mailed to your e-mail address on file and also stored in your control panel. These tools, options and features make your website powerful, flexible and of course, beautiful. *All upgraded accounts can choose a custom domain name at no charge. www.****.com. This makes your web address short, personal and easy to share. No registration fee to ever pay during your eWedding term. NEW - You can now setup custom email addresses with your domain name. ie. rsvp@janeandjohn.com, bride@janeandjohn.com, groom@janeandjohn.com, info@, you get the idea. Protect your privacy and wedding details with the optional password protection. Password protect your complete website or just individual pages. Even protect RSVP's individually if you like. Reorder your pages on your website navigation to any order, at any time and as often as you like. Rename your pages to anything, at any time and as often as you like. Even turn unused pages into new pages. For example, turn 'Our Vendors' into 'Our puppy Max!'. We offer a ton of pages, if you don't need certain pages, or don't need them yet, just turn them off. You can always turn them back on later if you need them. Upload up to three MP3 files for background music. Visitors to your site can switch between songs or shut the music off altogether. Max file size is 5mb. The theme you select at signup can be changed at any time. In fact, you can change your theme daily, or hourly, even by the minute! Your data is automatically loaded into the new theme in real-time. Don't worry about setting up every page right now, you can edit your site around the clock, 24/7. No limits on editing your website. Wondering how many people have been to your site? We keep track of unique visits and post it on your site and in your control panel. The counter on your website is optional. Each theme has a fun wedding countdown ticker. As if you don't already know how many days hours and minutes. Launch your site with some Flash! Animated Flash intros add fun and amazement for your friends and family. Don't lose all of your hard work, get a Keepsake of your site for future offline viewing. Save your photos, guest book comments, every page you have enabled. Select from either an immediate digital download or have it saved to custom silkscreened Keepsake CDs. “I stumbled upon ewedding while i was looking for a simple online RSVP for our wedding. After looking on ewedding i decided to start a trial account to see what ewedding offered. Without no interest in doing a web page, that change completely after i saw how easy and how elegant their site was. I would highly recommend the use of this website for an excellent way to have your guest be able to log on and RSVP, leave comments, and have a more interactive way to get involved. I havent had my website posted yet but im excited to send my RSVP card with my URL on them to see what people think!